No, it’s not intense curiosity about your drinking habits – it’s a colloquial way of greeting people in Nepalese culture. Whether you are strolling around the urban corners of Kathmandu or on your way to experience an adventure in the jagged Himalayan mountains, you are bound to encounter local people engaging in everything from lengthy philosophical conversations to rants about the mundanity of their daily lives over a cup of chiya – tea. Tea is the beverage with which the majority of the people in Nepal prefer to kick off their day and the beverage they offer to family, friends, and visitors, to remind one another of the positivity that can circulate in a karmic fashion. Cultivation of tea on the foothills of Kanchanjangha (the third highest mountain in the world, also known as Kangchenjunga) has a history dating back about 150 years. The first tea gardens were established in Darjeeling in the early 1800s, and slowly diffused to the hills of Ilam, Nepal. Since then, tea has not only become an integral part of the Nepalese culture, but also a valuable cash crop that is actively contributing to the local and national economy. There’s more to producing tea than just plucking a few leaves. The first step in tea production involves meticulously maintaining a “two-leaves, one-bud” recipe while plucking. Once plucked, the tea leaves and buds can be processed in two ways. The CTC method uses machinery to cut, tear and curl the leaves and buds, which are then oxidized to produce black tea, while the orthodox method involves rolling of the leaves and buds by hand before oxidizing them. 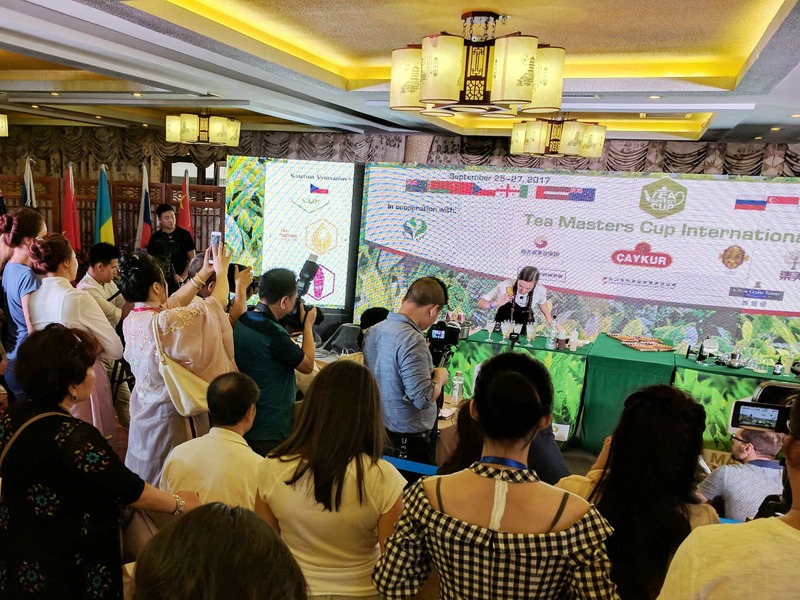 The orthodox process enables production of a wider variety of teas, ranging from white to black, by exposing them to different levels of oxidation. Although CTC allows for mass production, it is the orthodox method that allows for subtleties in taste, aroma, and color (important characteristics that determine the quality of tea) to be prioritized and maintained. According to the data archived by the Nepal Tea Board, Nepal currently produces about 23,000 tons (23 million kg) of tea per year. However, out of the 23,000 tons, only about 4,500 tons are orthodox and merely 200 tons certified as organic. It is of utmost importance for tea to be organic, as processing steps are devoid of any form of washing. Chemicals are first rinsed off in the cup of the consumer. Unfortunately, the organic tea industry of Nepal faces many challenges. Production of orthodox tea in Nepal is heavily oriented towards the foreign markets. This is corroborated by the fact that more than 80% of the orthodox tea produced in Nepal is shipped to various countries in Europe, and North America, however, this is almost always through middlemen who buy stock in India. One of the biggest challenges that remain is the lack of direct access to the international market. Orthodox tea produced here is first sold on the Indian market at a lower price, then is either sold directly in India or rebranded under Indian companies before making its way to the international market. As a result, not only do traders fail to fetch global market prices, but producers and farmers are tempted to increase their yields by excessively using chemical fertilizers and pesticides. Therefore, despite an estimate of 15-20% overall annual growth in the Nepali tea sector, these challenges demand our immediate attention. To combat such issues, Nepal Tea LLC and Nepali Tea Traders have ventured to directly import orthodox organic Nepali tea and distribute it to the wholesalers and retailers. This not only cuts the long chain of middlemen, but also provides the freshest teas directly into the hands of the end consumers, without chemicals, and at a fair price. The establishment of Kanchanjangha Tea Estate and Research Center (KTERC) in 1984 marked a significant milestone in Nepal’s organic tea industry. As the country’s first certified organic tea garden/factory, reciting the history of Nepal’s organic tea industry remains incomplete without telling the story of KTERC. In 1954, a 15-year-old Nepali boy visited Darjeeling. He was delighted by the serenity he found amidst the beautiful tea gardens blanketing the Darjeeling hills. While walking through the lush plantation, he began pondering upon the tea laborers’ high standard of living and started drawing parallels with people of his own village who were struggling to meet even the basic requisites of life. When he returned to Phidim (a small village in Ilam, Nepal), he brought back a vision to establish a tea factory that would uplift the living conditions of his village. That boy was Mr. Deepak Prakash Baskota. With strong determination and a revolutionary vision of organic farming, Mr. Baskota pioneered the organic movement. By pooling the marginal lands of more than 100 farmers into a cooperative model, he shaped KTERC into an environmentally conscious social business enterprise with the mantra “people and planet before profit”. The 95-hectare tea estate now operates with environmentally ethical principles at its core and takes pride in its promotion of sustainable practices in the factory and the village. KTERC provides free housing to the full-time farmers and free education to all the farmers’ children (2300 students have already been impacted and 96 students are newly enrolled in this year’s program). To further add to the allure of organic tea farming, it has introduced complementary developmental projects on a local level. One such initiative is the ‘cow-bank project’. KTERC, along with the help of Rotary Club USA, distributed 36 cows to the farmers. Farmers can then bring in additional income by selling milk and other dairy products in the market. Cow dung is bought back by KTERC to be used as organic manure for the tea gardens. The only obligation for farmers is to return their first calves to KETRC, so they can be distributed to other households in need. This model has proved to be not only sustainable but advantageous for farmers willing to go organic because of the potential for side earning and premium wages offered by the organic tea industry. Today, there are more than 295 hectares of land fulfilling the growing demand for organic tea just in that area. While the demand for Nepali organic tea remains paramount in the international market, the industry has been struggling to tap into the local tea market. Perhaps, due to the premium prices and limited production associated with organic orthodox tea, the majority of the Nepali population consumes CTC tea. Another potential reason for this could be a lack of awareness and exposure among the people, as tea farming is geographically limited to particular regions due to its ecological necessities. However, in recent years various tea bars and tea lounges have been popping up to educate the local population about Nepali tea, especially organic orthodox tea. Ting’s Tea Lounge, BG Tea Bar, and Teafresho are some prominent tea venues and considered pioneers in the field. Furthermore, organic farmers markets and organic tea fairs have also drastically helped the tea farmers/retailers sell their teas locally. On the production end, even though there has been steady progress, the industry is suffering from a labor deficit. Men are migrating overseas in droves in search of employment, leaving behind only the elderly, women and children. Despite the overall increase in the people interested in tea farming, a lack of active labor is an emerging issue. Providing training and learning resources can help overcome this problem. KTERC is planning on relocating individuals who lost their shelter during the recent earthquake and providing them with technical training and resources that will engage them with the tea trade. Furthermore, a free housing and free education model would further aid the victims of the natural disaster. Among all the challenges that the tea industry is facing, those relating to energy and technology are perhaps the most pressing. Fuel crises in Nepal are very common and ubiquitous. Despite exponential advances in available technologies, Nepal relies on old-school methods for tea production, like burning firewood. Therefore, shifting towards greener and more efficient energy to power the factories would enable stable production and increased yield and efficiency. It is equally important that the essential soil nutrients be preserved, as studies have indicated that soil health and biodiversity are imperative for the good health of the plant. Therefore, the application of advances in agricultural science and research could significantly aid in addressing the challenges faced by the tea industry. I believe that organic orthodox tea produced in Nepal is some of the finest quality tea you can find in the world. The international demand for organic tea is very high and expected to increase, while the local market is yet to be explored thoroughly. There are certain caveats in terms of usage of technologies, mobilization of labor forces and linking of local markets to the global. However, if these bottleneck concerns are addressed, the goods and services produced by the Nepali organic orthodox tea industry are bound to change the livelihoods of the farmers and in turn aid in the country’s economy. Therefore, this industry calls for a paradigm shift in its operation model – a shift that will boost the economy at the local and national level. We must transition into a greener and more efficient agricultural model that our present day socio-economical and ecological realities demand. *Photos provided by Nepal Tea. Special thanks to Nikesh Dahal and Sudeshana Karki for research and compilation. The link to BG Tea Bar goes to a broken, malicious website. I highly suggest removing it from this page. Miguel, our link goes directly to Facebook? Don’t know what you’re referring to. That is really odd. My mistake.